Organizing various docs for my thesis all in one .scriv file. Very powerful organization features. For example, I can attach pdf files of scholarly articles, nest various files on X under a certain category, add labels/tags to each file, etc. Displaying two docs side by side. I’ve using the vertical split display to have a translation doc open on the left (I was combing through Luke 1 in Greek the past couple of days) with a doc on the right where I keep verse-specific exegetical notes. Very handy. You could potentially use this to have, say, your thesis on the left with a research doc on the right. The auto-save feature. If I recall correctly, Scrivener autosaves virtually all the time and after any change you make to the doc. Today my laptop randomly shutdown and restarted right in the middle of my work. When I opened my file back up, it had saved everything. I’ve written more on software for thesis writing here. Yeah, LOVE Scrivener. I use it for practically all of my writing now, including blog posts. It’s proven very handy for writing and tracking entries for multiple blogs. It also opened up a fast and easy way for me to turn out Kindle Singles. 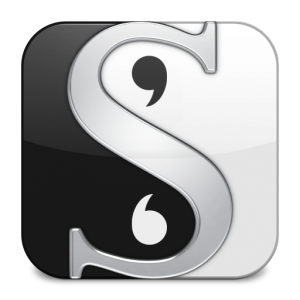 The only regret I have in my writing life, frankly, is that I didn’t use Scrivener when I wrote my previous books. It would have made combing back through for continuity and details MUCH easier. Come November, I’m going to crank it up to full and use Scrivener for NaNoWriMo. I haven’t participated in that for a while, thanks to my daily writing workload, but a friend has convinced me to do it with her, and I think the ONLY way I could pull it off and still keep my regular deadlines is by using Scrivener. Love it. Sounds great. Happy writing! Looks like we share a love for not only writing, but coffee. If anyone knows how to do the following in Scrivener, I’d be grateful for your help! 1) Turn OFF spelling correction: I use many early texts, and it’s “fixing” the spelling I’m trying to preserve: help!!! For what it’s worth, I’m writing a scholarly book and having a mixed experience with Scrivener. It’s extremely idiosyncratic in its formatting, so I find I’m nervous putting any text there, and am constantly copying texts into Word documents to feel safe. I also feel that a book project is really too big and unwieldy for it. Any experience that might be helpful to me in this would be welcome!